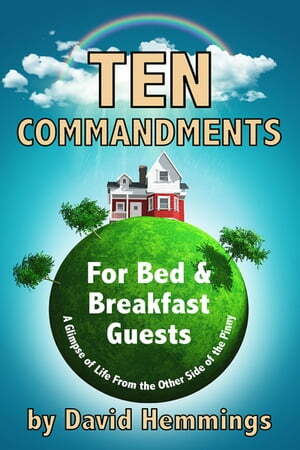 Collins Booksellers - Ten Commandments for Bed and Breakfast Guests: A Glimpse of Life on the Other Side of the Pinny by David Hemmings, 9781370445943. Buy this book online. Have you ever stayed at a B&B? A quick look at the reviews on, say, Trip Advisor and you have as much information as you need. This book is different. It looks at what it is like ‘on the other side of the pinny’. It’s intention is not to help you choose or run a B&B but to amuse and entertain with an account of the strange and bizarre people or events encountered by David and Irene Hemmings when they opened their door to strangers aka ‘guests’. Much of what happened and who turned up could not have been predicted, even by the most fertile imaginations, from the Swedish Mother-in-Law to exploding shower screens and a variety of bedroom encounters. It pauses occasionally to introduce ‘Captain Birdseye’ and the ‘Dangerous Brothers’ as well as looking at David’s boating incompetence. The lessons learned from running this B&B suggested the need for a set of house rules to be pinned to each bedroom door, that we have called the ‘Ten Commandments’.